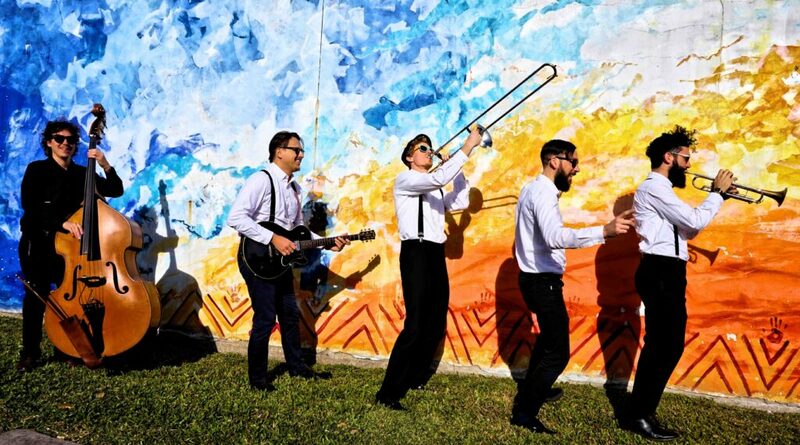 New Orleans-based band, Taylor Smith & The Roamin’ Jasmine are here to get your feet moving. Their songs are rejuvenated interpretations of 1920’s country blues, 1950’s New Orleans R&B, vintage Calypso from Trinidad, 1930’s swing, and even some 1950’s Country tunes, mixed in with original songs–all composed and arranged for a powerful horn section, upright bass, guitar and drums. They take sounds dug out from crates of scratchy, old 78’s, and polish them up with modern elegance and youthful energy, without losing any raw edginess. Inspired by the city’s history of ethnic and musical diversity, and fresh out of University of Miami’s Frost School of Music , bassist, vocalist, and bandleader Taylor Smith came to New Orleans in 2010 and began to collect some of his favorite vintage repertoire, while also composing some of his own songs inspired by the sounds he encountered live for the first time in the Big Easy. Arranging this collection for a six-piece jazz ensemble and giving it a healthy dose of New Orleans flavor, he decided to recruit like-minded colleagues, and bring his work to the streets of New Orleans, where most of the band members cut their teeth busking amongst closed storefronts on the sidewalks of the French Quarter at night. With three tours of the Europe under their belt including two performances at the Maverick Festival, one epic tour of Alaska, two years in a row of appearances at the LEAF Festival in Black Mountain, NC, plus a recent tour through Australia where they were featured performers at the Dashville Skyline Festival, they show no signs of letting up on roamin’ around the planet in 2018. Stay tuned for upcoming tour details, and news of collaborative works with Australian singer-songwriter Lachlan Bryan, and Louisiana locals to be announced. Learn more about Taylor Smith and the Roamin’ Jasmine at roaminjasmine.com. 2019 © AFF. Crafted with love by SiteOrigin.